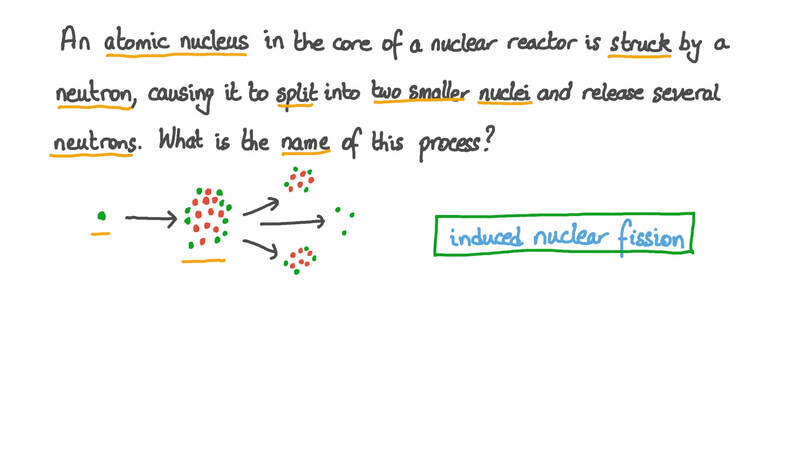 In this lesson, we will learn how to describe the process of nuclear fission and how nuclear fission reactors work. An atomic nucleus in the core of a nuclear reactor is struck by a neutron, causing it to split into two smaller nuclei and release several neutrons. What is the name of this process? Which of the following correctly describes the process of induced nuclear fission? AThe nucleus of an atom of a fissionable substance is struck by a neutron, causing the nucleus to split into two smaller fragment nuclei and release several neutrons. BThe nucleus of an atom of a fissionable substance is struck by a neutron, which is absorbed. The nucleus then becomes unstable and decays via beta decay. CThe nucleus of an atom of a fissionable substance is struck by a proton, causing the nucleus to split into two smaller fragment nuclei and release several protons. DThe nucleus of an atom of a fissionable substance is struck by a neutron, causing the nucleus to split into at least three smaller fragment nuclei. EThe nucleus of an atom of a fissionable substance is struck by an electron, causing the nucleus to split into two smaller fragment nuclei and release several electrons. Which of the following correctly describes the process of spontaneous nuclear fission? AThe nucleus of an atom splits without being struck by a neutron, resulting in two smaller nuclei and two or three high-speed neutrons. BTwo atomic nuclei collide and combine to form a single larger nucleus. CThe nucleus of an atom of a fissionable substance is struck by a neutron, causing the nucleus to split into two smaller fragment nuclei and release several neutrons. DThe nucleus of an atom splits without being struck by a neutron, resulting in at least three smaller nuclei and two or three high-speed protons. EThe nucleus of an atom of a fissionable substance is struck by a proton, causing the nucleus to split into two smaller fragment nuclei and release several protons. Which two of the following are used as fuel in nuclear fission reactors? In a nuclear fission reactor, the takes heat away from the core to a heat exchanger so that the heat can be used to generate steam for electricity generation. The slows down the neutrons produced through fission so that they are more likely to interact with another nucleus and keep the chain reaction going. The absorb surplus neutrons and keep the reaction under control. Which of the following describes the purpose of the coolant in a nuclear fission reactor? AThe coolant takes heat away from the core to the heat exchanger, where it is used to make steam that is used for power generation. BThe coolant is used to absorb some of the neutrons. This keeps the chain reaction under control. CThe coolant is used to speed up the fission neutrons so that it is more likely that they will interact with another fissionable nucleus and cause it to split. DThe coolant is used to slow down the fission neutrons so that it is more likely that they will interact with another fissionable nucleus. Which of the following materials is used for the control rods in a nuclear fission reactor? The control rods in a nuclear fission reactor are rods made of boron that are placed in the reactor core. Which of the following describes the purpose of control rods in a nuclear fission reactor? AControl rods are used to absorb some of the neutrons. This keeps the chain reaction under control. BControl rods are used to slow down the fission neutrons such that it is more likely that they will interact with another fissionable nucleus. CControl rods are used to remove heat from the reactor core, which is used to make steam for power generation. DControl rods are used to speed up the fission neutrons such that it is more likely that they will interact with another fissionable nucleus and cause it to split. Does removing the control rods from the core of the reactor increase or decrease the rate of the chain reaction? Which of the following is used as a moderator in some nuclear reactors? Which of the following correctly describes the purpose of a moderator in a nuclear reactor? AA moderator is used to slow down the fission neutrons such that it is more likely that they will interact with another fissionable nucleus. BA moderator is used to remove heat from the reactor core, which is used to make steam for power generation. CA moderator is used to speed up the fission neutrons such that it is more likely that they will interact with another fissionable nucleus and cause it to split. DA moderator is used to absorb some of the neutrons in the reactor and slow the reaction down. EA moderator is used to increase the number of neutrons in the reactor to speed up the reaction. How many neutrons are produced in this reaction?